Mingle Monday! I don't wish it was Sunday. Oh OK, I will spare you the horror of my improvised song making. But really, Mondays can be so awesome with a little mingling at Meg's. It's always a party, and you're invited! ~Catching up with old friends who live out of town is so amazingly wonderful! 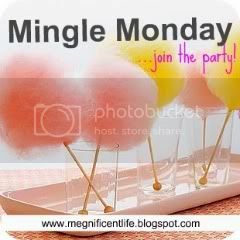 Here from Mingle Monday (:All awesome things to learn (: New follower! Nice list of things you learned over the weekend. Just stopping by from Meg's Mingle Monday, nice blog!